1898: Playing two road games in three days, Nebraska beats Colorado, 23-10, and the Denver Athletic Club, 11-10. 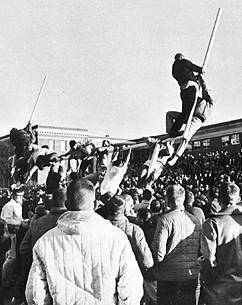 The NU-CU game was the first between the two schools. 1903: Nebraska rests many of its regulars in a 52-0 win over Bellevue College, a game that was essentially a tune-up for the Thanksgiving game against Illinois. 1908: Nebraska has a bye week before a game against Wabash. 1918: Nebraska loses to Camp Dodge, 23-7, in Lincoln. The Cornhuskers outyarded the military team by 2-to-1, but NU's only points came when Clarence Swanson recovered a fumble in the end zone during an unsuccessful punt attempt by Camp Dodge. 1923: Nebraska spoils Iowa State's homecoming by rolling to a 26-0 lead en route to a 26-14 victory. Three second-quarter touchdowns — one on an interception return — put the Cornhuskers in command. In the third quarter, a pair of 15-yard penalties threatened to derail a Nebraska drive, but Rufus Dewitz promptly connected on a scoring pass to Verne Lewellen from midfield. All of Iowa State's points came in the final quarter. «1928: A day after Coach E.E. Bearg had the Huskers scrimmage for three hours in place of the customary light workout, Pittsburgh pulls an upset by holding Nebraska to a 0-0 tie on a muddy field in Lincoln. 1933: Favored to deliver a victory and vie for the national championship, the Cornhuskers fall at Pittsburgh, 6-0. Meanwhile, George Sauer's play continues to earn him national recognition. 1943: Iowa gets its first win of the year — and its first victory in Lincoln in a quarter century — as Nebraska falls, 33-13, to the Hawkeyes. Nebraska trailed by just 14-13 after scoring late in the third quarter, but Iowa returned the ensuing kickoff 64 yards and took control of the game. 1948: Leading 6-0 at halftime, Missouri scores two touchdowns in the first six minutes of the third quarter en route to a 33-6 win on a sloppy field in Lincoln. 1953: Oklahoma cruises to a 30-7 win over Nebraska in a game that featured one of the most unusual punts in Husker history — a backwards, over-the-head boot by Ray Novak after he chased a bad snap into the end zone. The Huskers were outyarded 432-122. 1958: Larry Naviaux's 93-yard interception return provides NU its only touchdown in a 40-7 loss at Oklahoma. Nebraska picked up just four first downs and 107 yards of total offense. «1963: A day after the assassination of President John F. Kennedy, Nebraska secures an Orange Bowl berth with a 29-20 win over visiting Oklahoma. Thirty-nine points were scored after the third quarter ended with Nebraska holding a 10-0 lead. The win earned the Huskers their first conference championship since 1940. 1968: Oklahoma's Steve Owens rushes for 172 yards and five touchdowns as the Sooners overwhelm the Huskers, 47-0, in Norman. 1973: Nebraska runs over Kansas State in Manhattan, 50-21, but then is dealt a 27-0 drubbing at Oklahoma. 1978: One week after a stirring win over Oklahoma, the Huskers are upset at home by unranked Missouri, setting up a rematch with the Sooners in the Orange Bowl. 1983: Best team ever? That's the talk surrounding the Huskers, who are listed as 14-point favorites in their upcoming regular-season finale against Oklahoma. 1988: The Blackshirts make sure there's no Sooner Magic as Nebraska wins at Oklahoma, 7-3, in the Huskers' final game against a Barry Switzer-coached team. Also, Broderick Thomas is named one of four finalists for the Lombardi Awward, while he and coach Tom Osborne receive top Big Eight honors. 1993: Nebraska finds national respect hard to come by despite a 10-0 record. Trev Alberts is named one of three finalists for the Butkus Award. 1998: Florida and Florida State borrow successfully from Nebraska's defensive scheme. Scott Frost adjusts to life as a seldom-used NFL safety. 2003: The Lincoln Journal Star reports that Steve Pederson plans to force out Frank Solich. 2008: During the pre-Colorado bye week, backup QBs Zac Lee and Patrick Witt get more reps as Joe Ganz gets some rest. 2013: Pat Smith's field goal in overtime lifts the Huskers to a 23-20 win at Penn State.